One of the most creatively-rambunctious artists in the history of country music, a well-respected and prolific songwriter, and maybe most importantly, one of the best friends artists like Willie Nelson and Merle Haggard ever had, has passed away. Freddy Powers, known for so many contributions, but known best as an aficionado of country jazz passed away on Tuesday, June 21st. Powers had been battling Parkinson’s disease for many years. Born October 13th, 1931 in Duncan, Oklahoma, he moved to the small town of Seminole, Texas when he was six. It was there his family band would play Dixieland jazz tunes for locals, and Powers got his start in the music business. 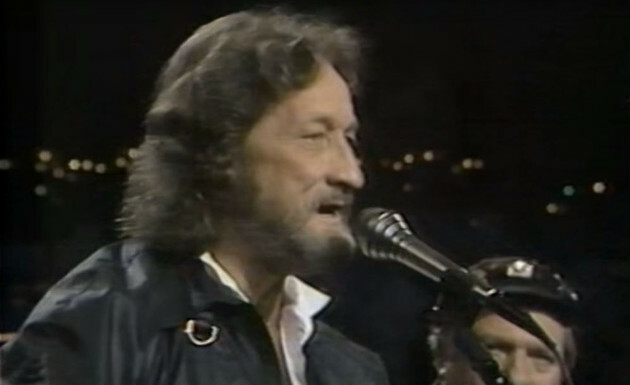 Eventually Powers would go on to receive some of the highest songwriting recognitions in country music, including the Triple Play award from the CMA for writing three #1 songs in a year. But in between, Freddy Powers would live a life that was like something out of a Hollywood script. After a short stint in the Marines, Freddy Powers fell in with noted instrumentalist Paul Buskirk, and began fusing country music with jazz. Before Willie Nelson became famous for writing songs for others, Powers cut a Willie Nelson tune called “Heartaches of a Fool” all the way back in 1955, and Willie even played bass in Freddy’s band for a while. Freddy Powers became known for his strange style of country that included a tuba player to give it that Dixieland flair, and made appearances on The Tonight Show and other high profile gigs with the outfit. The 60’s saw Freddy Powers taking residency in Las Vegas at the Riviera Casino during Sin City’s mafia era, where he cavorted with many of the town’s most notorious gangsters of the time. His Dixieland band, blazing banjo, and hilarious stage wit made him one of the most famous entertainers of his time in Vegas, where Freddy stayed until the mid 70’s when the Outlaw movement in country was turning everything upside down. It was Powers’ participation as a producer on Willie Nelson’s record Somewhere Over The Rainbow in 1981 that put him on Merle Haggard’s map, and that’s when his country music career really took off. The Freddy Powers / Merle Haggard friendship is the stuff of legend all to itself. The story goes that in 1981, Merle Haggard asked Freddy to move onto a houseboat beside him on Lake Shasta in northern California. Merle wanted to know more about jazz, and Freddy wanted to study more about country music. If you want to know how and where the horns and other jazz influences crept into Merle’s music later in his career, it was his friendship with Freddy. 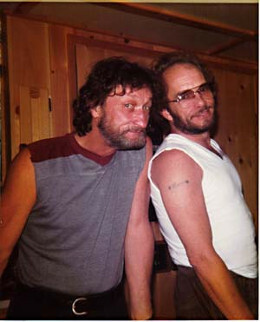 Both men had just gone through divorces, and for the good part of a decade, the Freddy / Merle days and nights were reportedly filled with wild parties and trips across Lake Shasta in a open air homemade plane the pair made together. The two even built their own houseboats. Also during this time, a lot of music was made between Freddy Powers and Merle Haggard. Powers became a mainstay in Merle’s backing band, and he wrote half the songs on Merle’s album It’s All in the Game from 1984. Merle and Powers also co-wrote the song “I Always Get Lucky With You,” which became a mega hit for George Jones, and Freddy also wrote material for Ray Charles. All of this success led to Freddy finally being able to release his own opus as a frontman, The Country Jazz Singer. There was also an appearance on Austin City Limits, and soon Freddy Powers was a legend in Outlaw country circles and beyond. Freddy formed the Freddy Powers Parkinson Organization which helped raised funds for research into the disease, and many benefits and other functions were held in Freddy’s honor throughout the years. Freddy Powers’ health continued to fail him, but his spirit never did, nor did his friends and collaborators who kept his influence on country music alive in their songs and albums. If you knew Freddy Powers, he was the funniest man you knew, even as he fought off the deteriorating affects of Parksinson’s. Though not as well-known as many of the artists Freddy Powers went on to influence and inspire, country music would not be as fun, off-kilter, and the jazz influences wouldn’t be as strong if it weren’t for Freddy Powers. Freddy Powers has a memoir called “Spree of 83” with contributions by Willie Nelson and Merle Haggard scheduled to be released via Waldorf Books in February 2017. Wow! Another great in the world of music is gone!!! R.I.P. Thanks Trigger for letting us know. Another great loss, to be sure. But I think we can be secure that both Freddy and Merle are reunited up there and resuming their musical friendship in heaven. Another legend leaves us. But I think we can be assured that Freddie and Merle are resuming their musical friendship in the Great Beyond. For those of us that dint know Freddy’s body of work, where should we start? As far as albums, “The Country Jazz Singer” is great, and can be easily found on iTunes, Spotify, Amazon, etc. And Freddy is all over that mid-80’s Merle Haggard stuff, as a player and songwriter. I have to admit I am surprised that it seems so few people know of Freddy. That’s not a knock on you Clark. I guess being down here in Texas, you tend to see his name more. Frankly I blame myself and the rest of the press for not being more out front about the importance of Freddy Powers. His Parkinson’s over the internet era I think put him unfortunately out-of-sight. The guy was massively important to country music in the 80’s. 80’s era Merle Haggard is my favorite, and I really enjoy all those albums from that decade. I really love the country jazz type feel The Hag had then especially the “Friend in California” album. I will definitely have to listen to Freddy Power’s and get familiar with his body of work more, as well as the links you shared. Thanks Trig! He is also survived by 4 children, 7 grandchildren , 3 great grandchildren, 1 sister, many nieces and nephews. Joni, He was actually survived by 5 children, 10 grandchildren, 3 great grandchildren. But this article from the press not an obituary, and that is where that kind of information can be found. It was not my intention whatsoever to omit reference to surviving family members in this obituary. As can be illustrated by these two differing comments, it was difficult for me to verify the list of survivors, and so I only listed the the one individual who I could verify, his wife Catherine. The intent of this obituary was to honor the legacy of Freddy Powers. To avoid any further conflict or confusion, I have omitted ALL reference to surviving family members, and will leave that information for the obituary from the surviving family members. I offer nothing but my sincere condolences to ALL of Freddy Powers’ family members and close friends. Trigger, it’s a GREAT article. Some people just want undue recognition. And thank you for the article on behalf of Catherine Powers and Freddy Powers.. The way you wrote it was perfect in my book!! Unless I’ve missed something, I’m pretty sure my father only had 4 children. Wishful thinking on someone’s part. thirties/forties jazz feel like he got in that clip. thanks for another great intro Trigger.